Every year when I come down for Spoleto’s kickoff, I try and make it to at least one of the events that Soteria and Charles are ushering. In doing so I’ve seen some amazing things–from the Alvin Ailey dance troupe to some very interesting performance art about a rabbit. This year I have tickets to two events: Les Ballets Trockadero De Monte Carlo, and the opera Philemon and Baucis, performed by the Colla Marionette Company. And there’s today, of course — the event I’m participating in — the Children’s Festival in Marion Square. It runs from 10-3 but I will be there starting at 11am. The weather has thunderstorms forecasted for today and it’s currently raining outside…but that’s Charleston. Judging by how this week has gone, it will be over in an hour and we’ll have a beautiful day ahead of us. 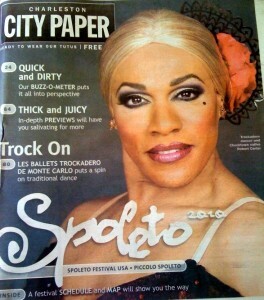 For those of you not at Spoleto, I feel very sad for you. But I hope you enjoy your weekend anyway! This entry was written by Princess Alethea and posted on May 29, 2010 at 7:45 am and filed under life, Soteria, south carolina. Bookmark the permalink. Follow any comments here with the RSS feed for this post.